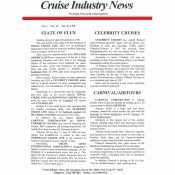 The Cruise Industry News Newsletter was published approximately 20 times per year and included the inside news of the industry, covering all topics. 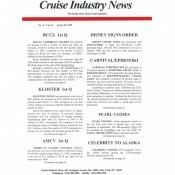 Subscribers included cruise lines, banks, travel agents, shipyards, ports, suppliers and more. They are now archived by year and are available for purchase in archived sets of PDFs, which are searchable. 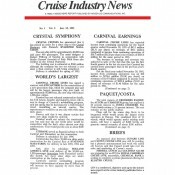 1987 archive of all Cruise Industry News Newsletter editions from that year. Downloadable zip file with searchable PDFs. Covering all news, financial reports, ship movements, deployment, rumors, executive announcements and other key parts to the year. 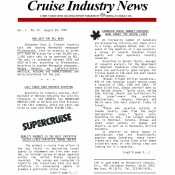 1988 archive of all Cruise Industry News Newsletter editions from that year. Downloadable zip file with searchable PDFs. Covering all news, financial reports, ship movements, deployment, rumors, executive announcements and other key parts to the year. 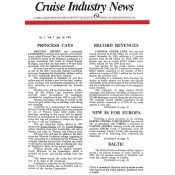 1989 archive of all Cruise Industry News Newsletter editions from that year. Downloadable zip file with searchable PDFs. Covering all news, financial reports, ship movements, deployment, rumors, executive announcements and other key parts to the year. 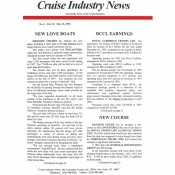 1990 archive of all Cruise Industry News Newsletter editions from that year. Downloadable zip file with searchable PDFs. Covering all news, financial reports, ship movements, deployment, rumors, executive announcements and other key parts to the year. 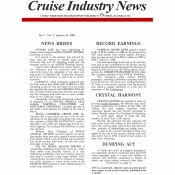 1991 archive of all Cruise Industry News Newsletter editions from that year. Downloadable zip file with searchable PDFs. Covering all news, financial reports, ship movements, deployment, rumors, executive announcements and other key parts to the year. 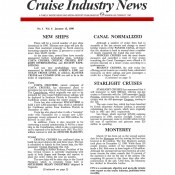 1992 archive of all Cruise Industry News Newsletter editions from that year. Downloadable zip file with searchable PDFs. Covering all news, financial reports, ship movements, deployment, rumors, executive announcements and other key parts to the year. 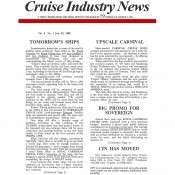 1993 archive of all Cruise Industry News Newsletter editions from that year. Downloadable zip file with searchable PDFs. Covering all news, financial reports, ship movements, deployment, rumors, executive announcements and other key parts to the year. 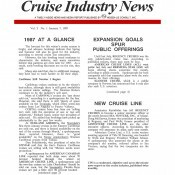 1994 archive of all Cruise Industry News Newsletter editions from that year. Downloadable zip file with searchable PDFs. Covering all news, financial reports, ship movements, deployment, rumors, executive announcements and other key parts to the year. 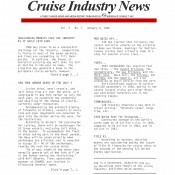 1995 archive of all Cruise Industry News Newsletter editions from that year. Downloadable zip file with searchable PDFs. Covering all news, financial reports, ship movements, deployment, rumors, executive announcements and other key parts to the year. 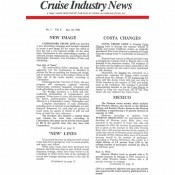 1996 archive of all Cruise Industry News Newsletter editions from that year. Downloadable zip file with searchable PDFs. Covering all news, financial reports, ship movements, deployment, rumors, executive announcements and other key parts to the year.